Over thirty years of laughs and cheers! Rare Ltd. (formerly Rareware) is a Twycross-based (though they started in Ashby-de-la-Zouch) video game development company founded by Chris and Tim Stamper in 1982. They're famous for their pioneering of sophisticated technology to make video games, the sheer amount of crap they get past the radar, the idiosyncratic little mysteries they weave into their games that leave gamers pondering for decades, and their media-shy nature. While the company attained most of their early fame (as "Ultimate Play the Game") through their games on the ZX Spectrum, they are best known for their work with Nintendo. In 1985, the Stamper brothers figured out how to reverse-engineer an interesting new video game console from Japan known as the Famicom. Nintendo was so impressed that they gave them an unlimited budget to produce titles for the system, which they proceeded to do to the tune of around sixty games under the new name "Rare" (having sold the "Ultimate" brand). While this period brought about games like Battletoads, it would be the SNES-era where they'd find the start of their biggest wind of fame and success. Rare poured much of the money earned during the NES years into Silicon Graphics workstations, making them one of the most technologically advanced developers on the planet. Their subsequent experiments with the new technology once again managed to impress Nintendo, with the Japanese company now buying a 25% stake in the company (which would eventually grow to 49%) and giving Rare the option to work with one of their characters. They chose Donkey Kong, a once popular character that had fallen by the wayside in the face of Super Mario's popularity, believing that they could revitalize the character and make him relevant once more. Now renamed Rareware, the company released Donkey Kong Country in 1994 to great financial and critical-acclaim, becoming the best-selling game for the system behind only Super Mario World. Additional entries in the Donkey Kong Country series were created throughout the SNES's lifespan, with the ape enjoying newfound popularity and the studio some high levels of attention. The company would hit their stride come the Nintendo 64, where they became known for tackling whatever genre they wanted... and subsequently making one of the best entries in it. The First-Person Shooter? GoldenEye was the first game to make the genre work on console, years before Halo. The Mascot Racer? Diddy Kong Racing brought story modes, missions, and multiple vehicle types to the table. The Fighting Game? Say hello to Killer Instinct with its unique rock-paper-scissors combo system. And the Platform Game? There is no shortage of people who argue Banjo-Kazooie to be superior to Super Mario 64. If the SNES days proved Rareware to be a great developer, then the games this Nintendo second-party developer made for the N64 only cemented that fact. Early during the Nintendo GameCube's life, however, a big change was on the horizon. While in the midst of producing Star Fox Adventures, Rareware began looking for potential companies to fully buy out the studio, to help offset the rising costs of game development. With Nintendo surprisingly refusing to acquire the studio, the Stamper brothers found themselves being bought by Microsoft, who had recently entered the video game market and had been courting the developer for some time. The deal closed in late 2002 after Activision failed to make a better offer, and Rareware (now named "Rare" once more) was now a first-party developer for the Xbox. Rare retained ownership over their own characters and properties in the change, while Microsoft granted Rare permission to continue producing games for Nintendo handhelds if they so wished. For their part, Nintendo did actually end up acquiring a Western game developer that same year after all. It would just turn out to be one more American than British. Under Microsoft, Rare would make games that received mixed-to-positive critical reception, with most becoming financial disappointments to varying degrees. Fans would come to feel that the UK-based developer had lost some of the magic it had when under Nintendo, and this sentiment would only become stronger over time, with the departure of Chris and Tim Stamper in 2007 not helping. Following the fan backlash towards and commercial failure of Banjo-Kazooie: Nuts & Bolts, Rare would find themselves tasked with making sports games solely for the Xbox 360's Kinect peripheral. Kinect Sports would receive positive reviews for managing to differentiate itself from Nintendo's Wii Sports series, and ended up being the most successful game produced by the developer in years, leading to a similarly successful sequel, but a failed third entry on the Xbox One. 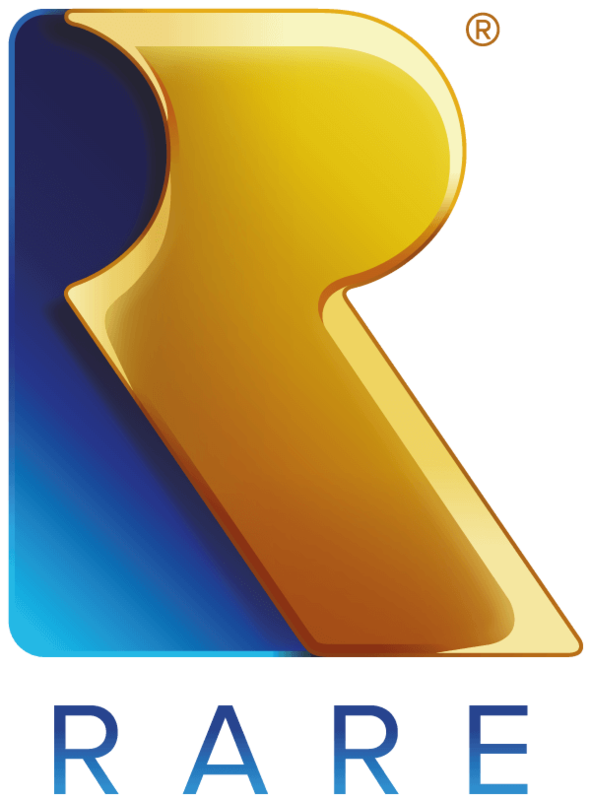 By this point, several key employees had left Rare to form the indie company Playtonic Games and make the kind of games Rare used to be famous for in the N64 era. Their first game, Yooka-Laylee, would release in 2017 to mixed-to-positive reviews. In addition, while Rare properties would be utilized, it would be other companies playing with the characters, such as Double Helix Games with Killer Instinct. However, just as fans were beginning to finally lose hope in the developer, Rare released Sea of Thieves. While not as beloved as older Rare games, receiving mixed reception, many still view it as a return to the previous creative energy and experimentation that Rare was known for. Author Appeal: Funny Animal, Dem Bones, Cool Cars, Baleful Polymorph, and Sphere Eyes. Female characters are also prone to Hartman Hips, Animesque, and You Gotta Have Blue Hair. Compilation Re-release: Rare Replay for the Xbox One was a release of thirty titles they were well known for. For Liscensing reasonings, this naturally excluded their Donkey Kong games or Goldeneye. Creator Thumbprint: Keys. Enormous keys, bigger and heavier than the characters, the most famous being the infamous ice key from Banjo-Kazooie/Banjo-Tooie. Both Diddy Kong Racing and Donkey Kong 64 feature gigantic gold keys as plot coupons; finding or using a key is always a momentous occasion. Atic Atac was all about finding the four small(ish - they're the same size as a wrench) keys that unlocked the doors to find the ACG Master Key, a gold key that took up your entire inventory. Friendly Rivalry: In their golden age the teams within Rare were closed off from each other and according to Chris Seavor in his director's commentary for Conker's Bad Fur Day would constantly be trying to out do one another when working on their projects. Funny Animal: Often sporting Heroic Builds (the Battletoads, their take on Donkey Kong, Kremlings, etc.). Gotta Catch Them All: The trend started in the Donkey Kong Country series, where progressively more and more items were needed to attain 100% Completion. Later, Banjo-Kazooie, while a great game, had a rather large number of collectibles. Finally, Donkey Kong 64 took things Up to Eleven and killed the genre in the process.